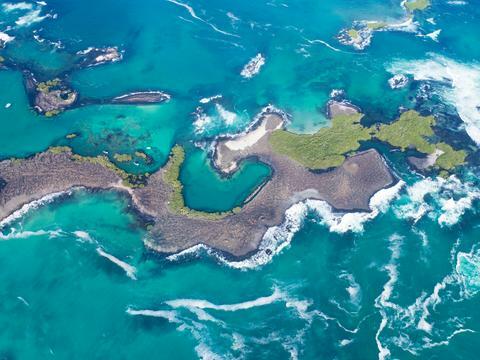 As the Wanderlust guide to the Galápagos says: "Most of us dream of making a pilgrimage to this mystical archipelago". No matter how many documentaries you see, nothing compares to being there - clambering the same banks as Charles Darwin, wandering the same ground as Lonesome George, or hearing the fizz of a Galápagos penguin swim past. This is your chance to make your dream happen on an exceptional voyage in the company of special guest Stanley Johnson. 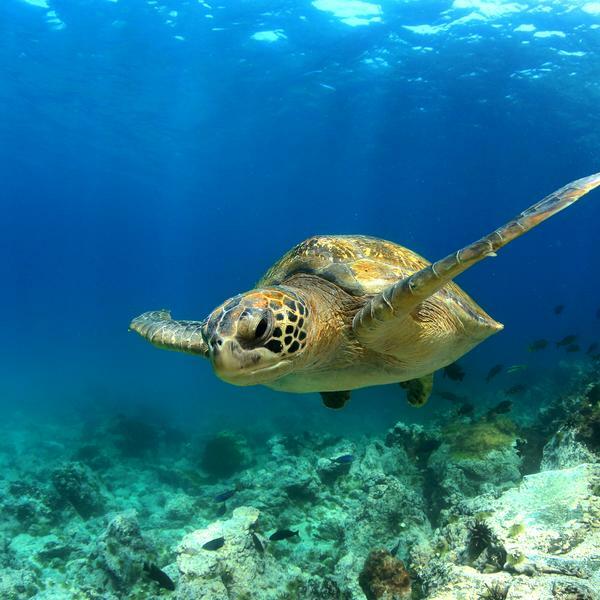 His passion for the environment and role as ambassador for the Galapagos Conservation Trust make him the ideal travelling companion for this extraordinary destination. "Even if you have seen television programmes on the Galapagos, nothing prepares you for the reality. I hope you can join me in these extraordinary 'enchanted islands' next year." 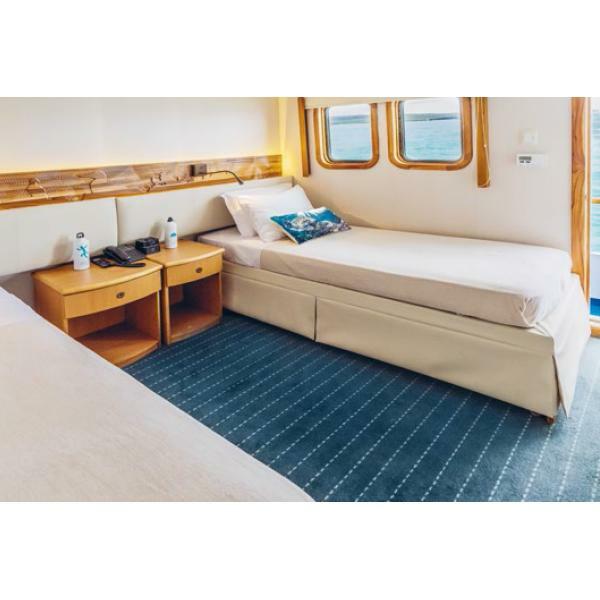 * New offer on lower deck porthole cabins! 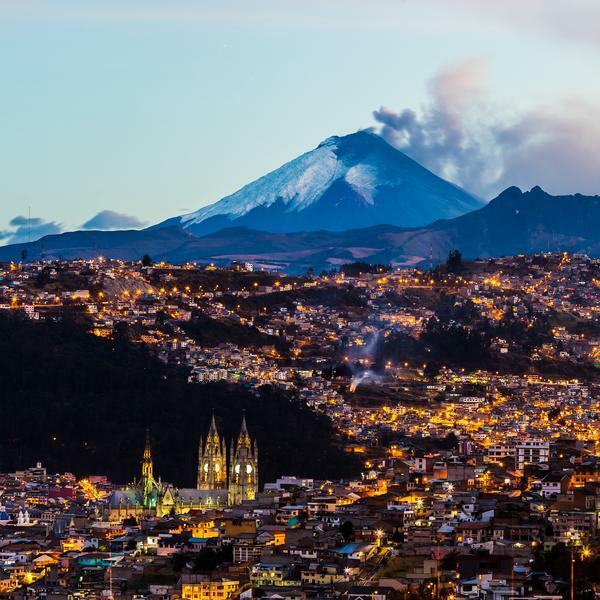 Save £800pp*, and receive internal flights, a seven-night full-board cruise aboard the Coral I yacht, national park guides, talks from a Galápagos Conservation trust Honorary Ambassador, plus a bottle of wine on arrival to your Quito hotel. Hear stories from the lifelong environmentalist on board, who is also an ambassador for the Galapagos Conservation Trust. See first hand this far-flung archipelago which has had such an extraordinary impact on the scientific world. 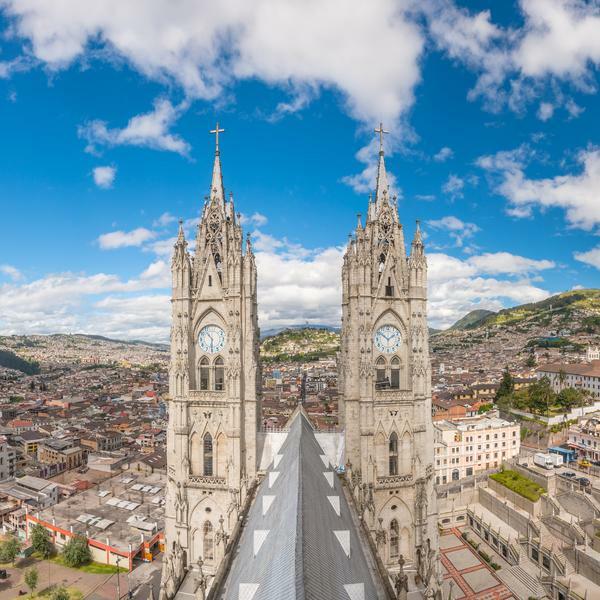 Stay in the Ecuadorian capital city before and after your cruise, and enjoy its spectacular location, heritage and architecture. Witness the islands’ unique wildlife up close – from pelicans, Darwin’s finches and flamingos, to iguanas, sea turtles and sea lions. 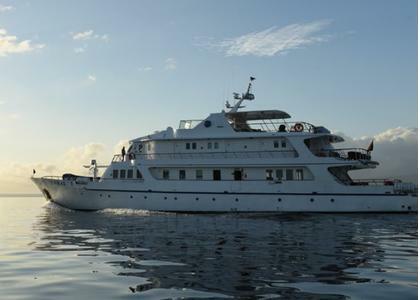 Spend eight days sailing on the Coral I yacht – a beautiful, comfortable vessel with capacity for just 34 guests. 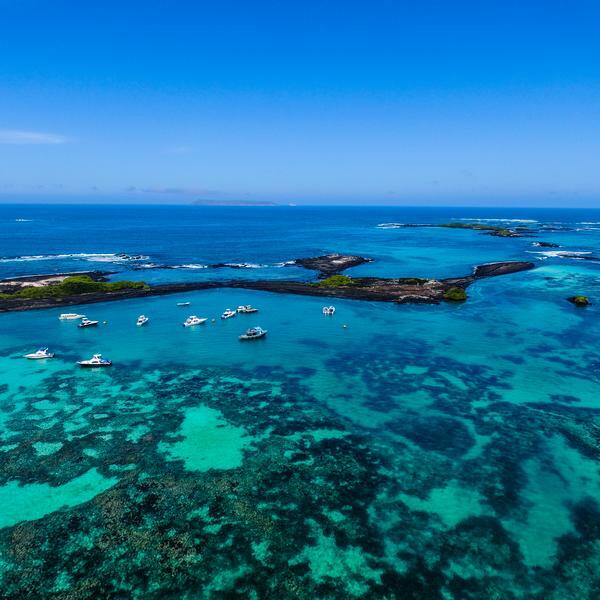 Explore the waters around the Galapagos by panga boat, or enjoy a swim or snorkel in the waters surrounding the islands. 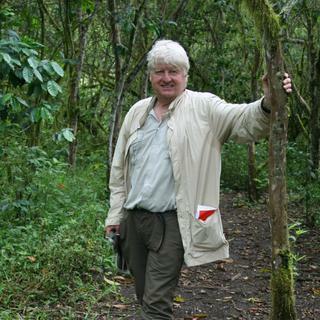 One of Britain's leading environmentalists, Stanley Johnson is an author, journalist and former Conservative member of the European Parliament, who has also worked in the European Commission. 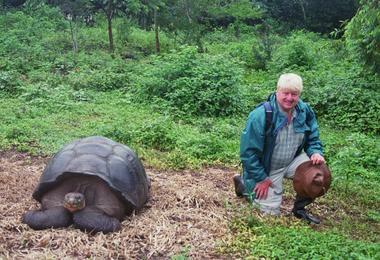 A past recipient of the Greenpeace Prize for Outstanding Services to the Environment, as well as the RSPB Medal and WWF's Leader of the Living Planet Award, Stanley is an ambassador for The Galapagos Conservation Trust as well as for the United Nations Environment Programme Convention on Migratory Species (CMS). In addition to numerous non-fiction works on environmental topics, Stanley has also written 10 novels, the latest of which - KOMPROMAT- is being made into a six-part TV series.. Stanley appeared last year on I'm a Celebrity…Get Me Out of Here and in the third series of the Real Marigold Hotel. * Departs 2019. Price based on two sharing a cabin. Subject to availability. Not including international flights. A single supplement applies for solo travellers. 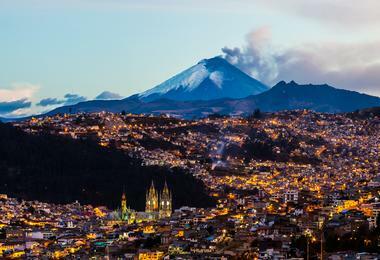 Today you will arrive in the charismatic Ecuadorian capital of Quito. You will be transferred from the airport to your hotel, where you will have a welcome briefing in the afternoon. 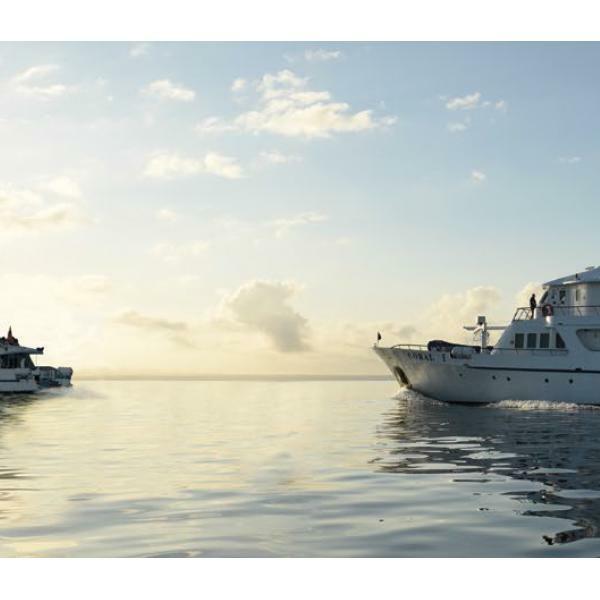 In the morning you will make an early transfer to catch your flight to the Galapagos Islands. On arrival you will be picked up at the airport by naturalist guides and taken to board the Coral I yacht. 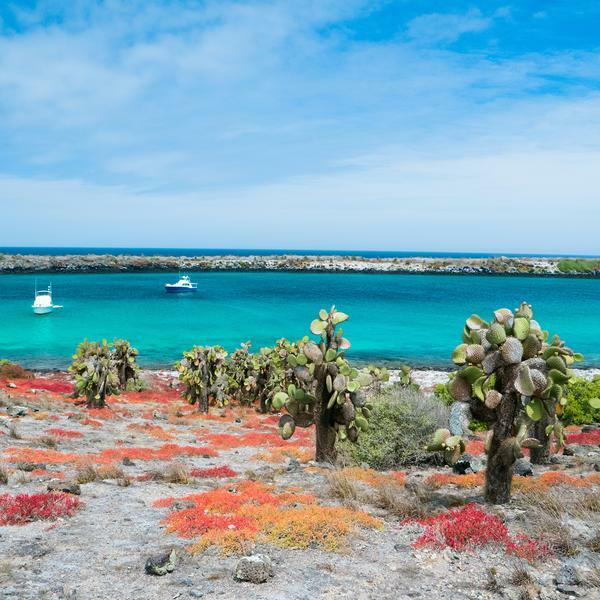 In the afternoon, visit the Interpretation Centre on San Cristobal Island, which offers an excellent background to the formation of Galapagos and its significance in the world. Then hike to Frigatebird Hill (Cerro Tijeretas), where you will be able to see frigatebirds and enjoy a beautiful view of the bay below. Head ashore on our pangas (dinghies), passing the sheer faces of stunning cliffs of "Sorcerer's Hill". You are likely to be sharing the beach with sea lions. You could also choose to snorkel from shore or trek to a hidden lagoon, where you can see black-necked stilts, ruddy turnstones, whimbrels and white-cheeked pintails. In the afternoon, head to Punta Pitt and Islet, the only place in the islands where we will enjoy the chance to see all three of the booby species in the same place. One of the highlights of the trip, Punta Suarez on Española Island is paradise for naturalists. 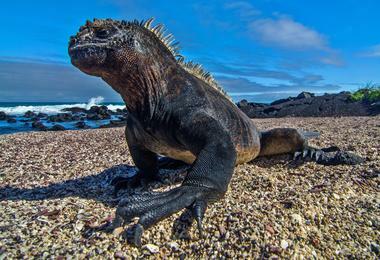 From the moment you arrive here, you will see marine iguanas and sea lions. During the walk that follows you are likely to encounter boobies, endemic lizards, gulls and a dramatic blowhole. If you are lucky, you may also get to see the complex courtship display of the endemic waved albatross. 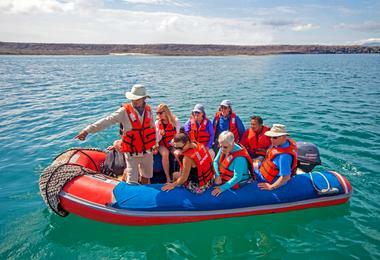 In the afternoon, explore one of the most stunning beaches in all of Galapagos in Gardner Bay. 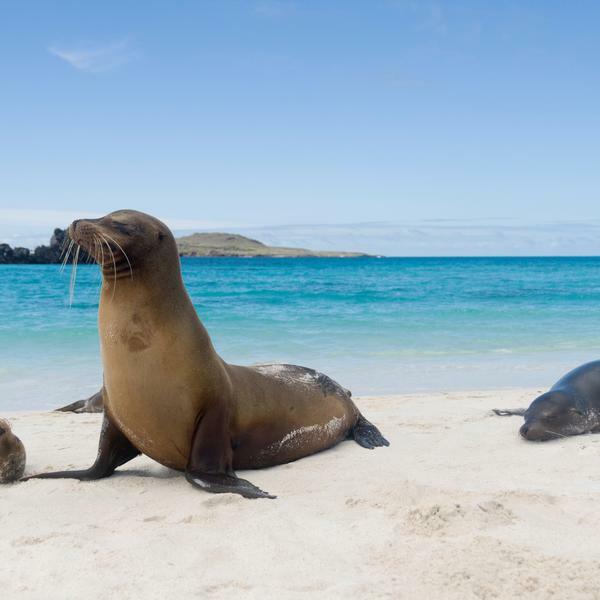 This extensive sandy beach is home to many Galapagos sea lions, who are unafraid of humans. Watch out too for Hood mockingbirds, endemic to this island, and Darwin's finches. You will also have the option to snorkel here if you wish. On arrival, you may observe a green tinge to the dark beach - this is a product of olivine, a volcanic crystal. Walk to a large, shallow lagoon often dotted with flamingos, before continuing through a forest of palo santo trees to a white beach, where green turtles nest. Paddle barefoot in the shallow water we you can spot diamond stingrays and white-tipped reef sharks. A small colony of penguins resides on Floreana and can sometimes be observed as well. Today you will also have the chance to snorkel at Devil's Crown, an eroded volcanic cone, with an abundance of marine life: yellow-tailed surgeonfish, salemas and creole fish. 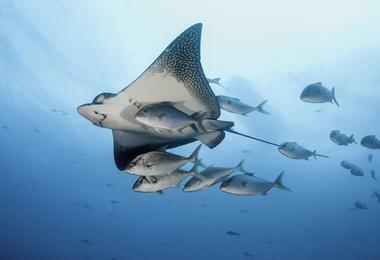 Turtles, spotted eagle rays, parrotfish, and even hammerhead sharks have also been spotted here! In the afternoon, visit the famous Post Office Barrel, where whalers and fur-sealers used to leave their letters to be picked up by homeward-bound colleagues. 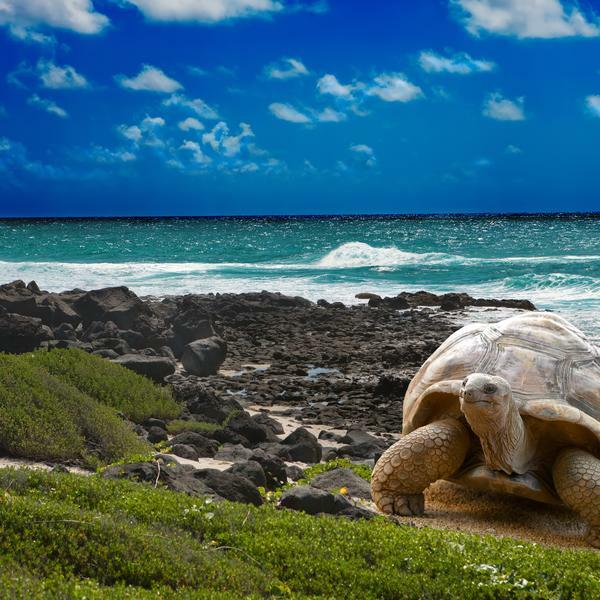 The central highlands of Santa Cruz Island is the ideal place to encounter wild Galapagos giant tortoises. 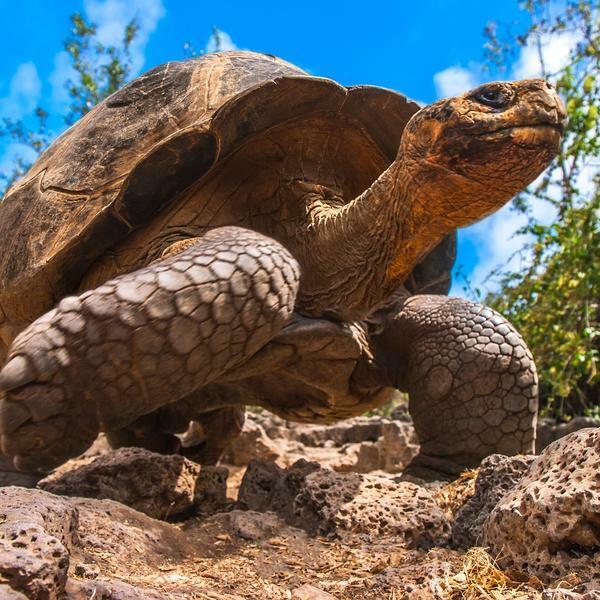 In the afternoon, visit the Charles Darwin Research Station, once home to Lonesome George, the last tortoise of the Pinta race. The native flora of the grounds are a good place to spot some of the more elusive birdlife of the islands including the woodpecker, cactus and vegetarian finches. This morning you will arrive at a small lava dock, where marine iguanas blend in to the dark rock as they bask in the sun. On a circular path, you'll walk past a lake often inhabited by feeding flamingos. Waders including stilts, turnstones and sandpipers work the muddy edges looking for food. Further inland is a dry, forested area where land iguanas nest and keep their burrows. In the afternoon, the boat will land on Bartolome Island, which overlooks the famous Pinnacle Rock and Santiago Island beyond. 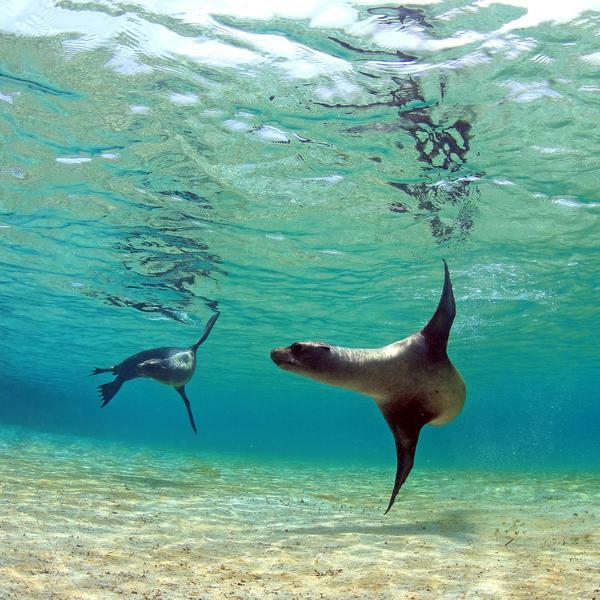 A snorkel in the waters around here may bring encounters with Galapagos penguins, white-tipped reef sharks and sea lions. 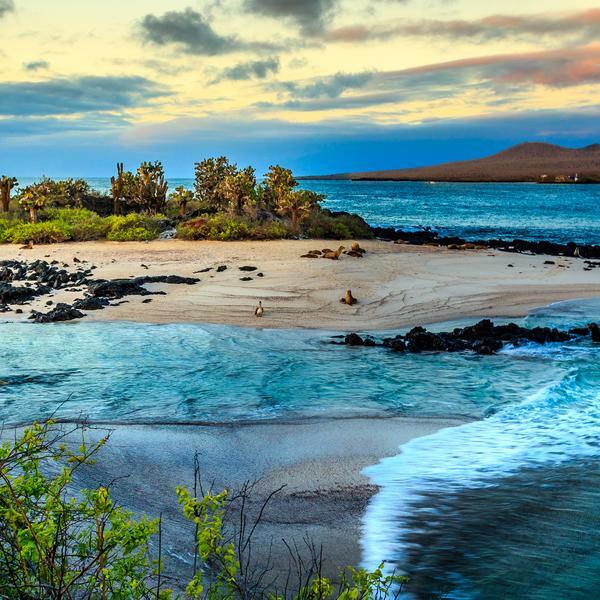 At the heart of the Galapagos, this striking island with its eye-catching red-sand beach is home to sea lions, mockingbirds, finches, Galapagos doves and vermillion flycatchers. 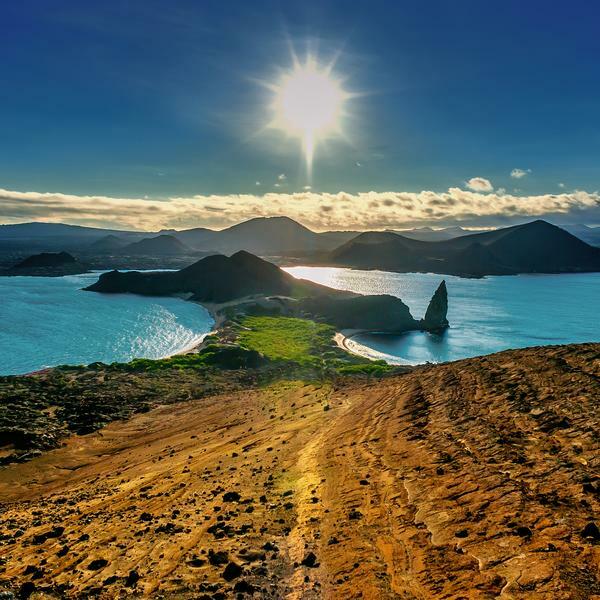 Walk through a forest of palo santo and cacti to a beautiful overview of the bay: you can snorkel here, often with large schools of black-striped salemas, sea lions and turtles. In the afternoon, land in Buccaneers Cove on Santiago Island - an amazing location, featuring an eroded shoreline. Then visit the white sands of Espumilla Beach, where you will also find mangroves, a small palo santo forest, salt-water lagoons and wading birds such as flamingos. Back on Santa Cruz Island, explore four species of mangrove in the tidal lagoon system. A panga ride will take you into the labyrinth: spot turtles, herons, sharks and rays in this otherworldly environment. After the visit, transfer to the airport to fly to Quito where you will transfer to your hotel. No activities are planned for this final day. Your departure to the airport is included, and will be available at any pre-arranged time. 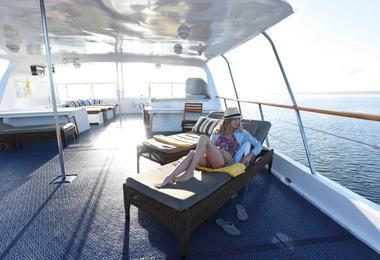 The Coral I is a supremely comfortable yacht, with three decks of spacious amenities and cabins. 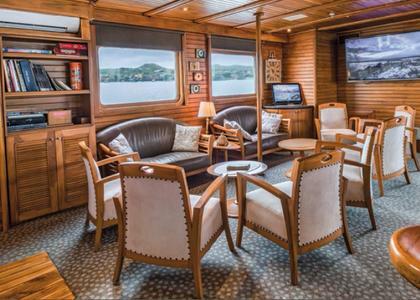 She is a small vessel, but the indoor and outdoor spaces feel generous - and you'll even find a whirlpool on the open-deck area. 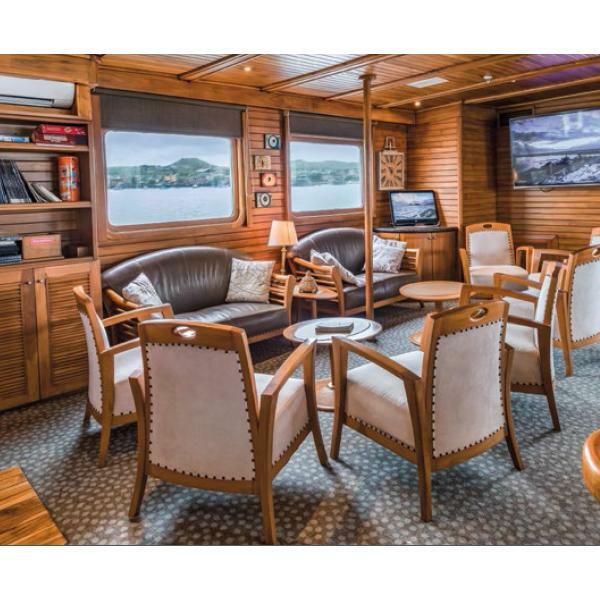 Boarding Coral I is like stepping onto a private yacht - with an excellent restaurant serving Ecuadorian and international cuisine, BBQ dinners on the open-air Moon Deck, and enough well-appointed cabins for just 34 guests. Intrepid Travel is a leading expert in small group holidays to the world’s most fascinating destinations. To view Intrepid Travel’s supplier’s terms and conditions click here.